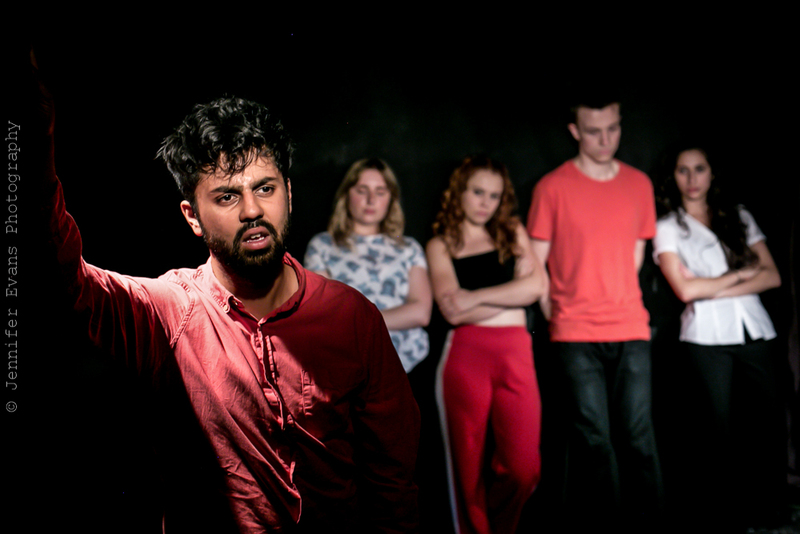 Glass Half Full Theatre are dedicated to telling contemporary stories that are engaging,funny and thought provoking. We aim to make theatre for all, unpretentious, real, hard hitting and FUN! Stephanie set up Glass Half Full after finishing a Foundation Acting course at Italia Conti Academy of Theatre Arts 2015-2016. She then took classes under Mary Doherty at The Actor's Class (Intermediate and Foundation). Stephanie then found a love for writing and producing, she currently produces for Actor Awareness and New Dreams Theatre. Heather is a Mountview Graduate and is joining Glass Half Full Theatre as an associate artist after extensive work on projects such as 'Where Did God Go? 'SlamKings, 'Our Big Love Story' Norstock festival and SlamKings, 'Baby' Arcola, SlamSoaps and recent production 'How To Save a Life'. Heather will be acting and directing in upcoming Glass half Full productions. Recently premiered at The Hope Theatre, Upper Street March 2018. SERIES OF short PLAYS is a new writing platform for writers and directors. It is an event that takes space over two days and gives a unique spin to the average fringe new writing night. Using 4 directors and a pool of actors we give 4 writers two very different versions of their play. We hope this style of event nurtures the writers into discovering new ideas for going forward. SERIES OF short PLAYS IS BACK AND THIS TIME WE HAVE BEEN ON THE SEARCH FOR THE BEST COMEDY AROUND! We are bringing the work of comedic genius Harry ter Haar to you in a whirlwhind evening of 6 plays that Harry has had performed all over the fringe circuit. She loves cake, glitter and she's got Cancer. Join us she tells the story of the lead up to her death party. Adark comedy about friendship, love and loss. We hope to bring awareness to Smear tests and Cervical Cancer screening. 'Our Big Love Story' at The Hope Theatre March-April 2018. Photo Cred Jennifer Evans Photography. Actors above in order Holly Ashman, Alex Britt, Naina Kholi and Emelia Lovsey. 'The Monologues of a Tired Nurse' Barons Court Theatre, Feb 2017. Photo cred: Jennifer Evans. Glass Half Full Theatre will be offering Monday workshops to writers, directors & actors for a mere £10. The workshop involves 4 writers and 4 actors and 4 directors. The sessions will begin with creatives introducing themselves then the writers will be led by Stephanie Silver throughs several workshops to write a brand new monologue, different exercises and techniques will be used. The first hour the writers write and the actors participate in vocal exercises, warm ups and physical movement before combining with the writers in the last hour to perform one of the monologues. The directors will join in with the actors warm up and exercises as we believe the relationship between the two should be collaborative and nurtured and they will have a chance to redirect one monologue/actor. We aim to hold them every second Monday of the month, Venue and times TBA. 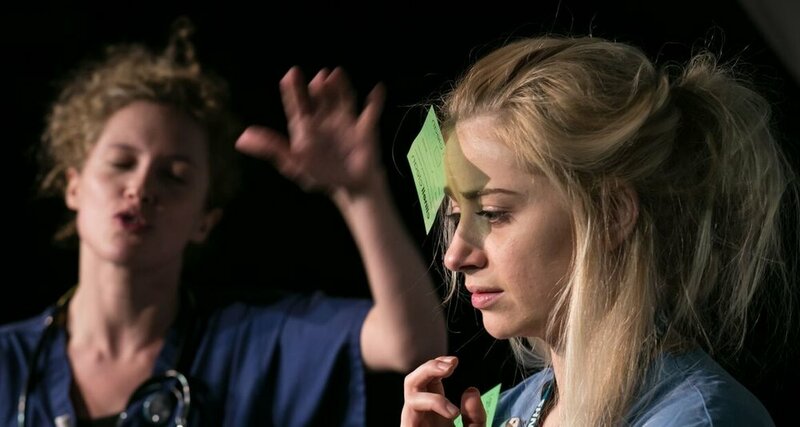 Weekday Workshops is a chance to work on scenes from popular plays. Two Mondays a month we will choose sides from a play. The workshop will start with a short warm up and welcome then we shall be divided into pairs to work on scenes to be presented to the class. This is a informal workshop for actors to play. The class size is max 10 and run for 1 hour. Run by Stephanie Silver. Workshop cost £10. Venue and time tba.